A Christmas album is exactly what we all expected from Stone Temple Pilots singer Scott Weiland right? Of course it was, so enter The Most Wonderful Time Of The Year. I'll leave the Weiland-white Christmas jokes to others and focus on the record itself. 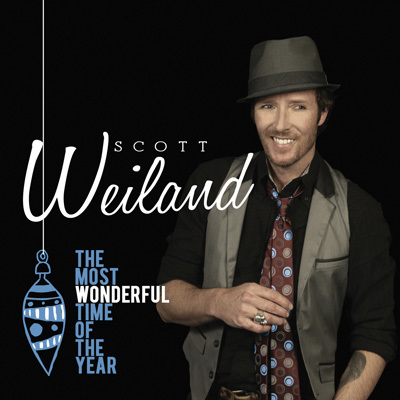 Striking you right off the bat is that Weiland has decided to croon this record. No, he's no Bing Crosby, but it's an interesting way for him to go on "The Christmas Song". That put on croon is backed by conservative arrangements that include strings, piano, and brushed drums. By the time you get three or four songs deep into the album however, that schmaltzy act has worn thin. Thankfully, it's at about that point when Weiland decides to mix things up a bit. It begins with a refreshing copacabana shuffle on "Silent Night", a sound that reappears, complete with steel drums, on "Happy Christmas and Many More". The title track is peppy, with a jazzy big band arrangement. On "What Child Is This?" Weiland takes a smooth, loungy turn. The schmaltz creeps back in from time-to-time, with an atrocious vocal on "Have Yourself a Merry Little Christmas" being the low-water mark. Rounding out the uneven album is very elegant and respectful rendition of "Little Drummer Boy". The Most Wonderful Time Of The Year is not much more than a curiosity, but it's probably going to be far from the worst Christmas album I hear this year. Best tracks: "Silent Night", "Little Drummer Boy"